Nutritionists and foodies always talk about “eating seasonal” foods, especially when it comes to fruits and vegetables. The funny thing about that is that pretty much anything we could want is always in season somewhere, so most foods are available year round. Some things might be more expensive at certain times of the year, but the quality is usually not all that bad. Except for most tomatoes. And rhubarb. Maybe it’s because I only look for it in the spring, but I’m thinking rhubarb might be a bit of an exception. I see tons of it in April, but not really any other time of the year. I love a strawberry or blueberry -rhubarb pie or crisp, because it just screams “get lost winter – spring is coming through!” One time I thought I bought it at a farmers market in the summer, and I could hardly contain myself. “Rhubarb – in the middle of the summer! !” Then as I was trimming away the leaves I realized what I actually bought was Swiss Chard. Duh. Can you see why I was confused?? This recipe isn’t exactly low calorie either, but it’s extremely delicious. 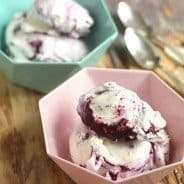 Roasting wild blueberries with rhubarb concentrates their flavors and sweetness, and that makes for a really rich fruit swirl though the cheesecake flavored ice cream. Did you get an ice cream maker yet? You’ll need it for this recipe! Preheat the oven to 375 degrees. Place the blueberries, rhubarb and 1/4 cup of sugar in a pie plate or baking pan and toss together to combine. Roast the fruit for about 30 minutes or until the juices start to evaporate, the fruit is broken down, and the mixture starts to thicken. Remove from the oven and let cool. It will continue to thicken as it cools, so don't let it get too thick in the oven. Mix together cornstarch and 2-3 tablespoons of the milk in a small bowl and set aside. When the fruit has cooled a bit, stir in 1 tablespoon of the cream cheese that has been cut into very small pieces. Swirl to let the cream cheese melt a bit, but leave some solid pieces. Place the remainder of milk, cream, remaining 1/2 cup sugar, and corn syrup in a medium sauce pan, stir to dissolve sugar, and bring to a boil over high heat. Reduce heat to medium-low, add in the cornstarch and milk mixture and stir to combine, and let cream-milk mixture simmer for 4 minutes. While the cream is simmering, mix salt with remaining 3 tablespoons of softened cream cheese in a small bowl. Remove the cream from heat. Add 2 tablespoons of hot cream into the cream cheese-salt and stir to combine, and then add this back into the hot cream. Add vanilla to the cream. Transfer the cream mixture to a ziploc bag, or airtight container, and the fruit to another bag or container. Refrigerate both containers until cold, about 2 hours or overnight. When everything is chilled, pour the base into a frozen canister of an ice cream makes and spin until thick and creamy, about 30 minutes. 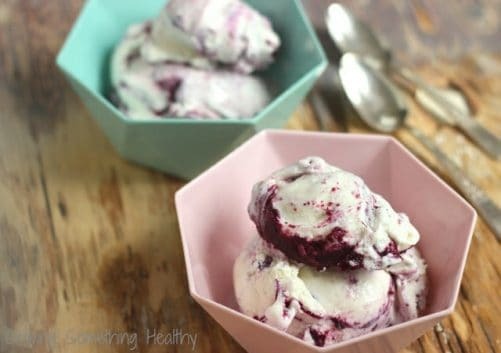 When the ice cream base is to desired thickness, add a few spoonfuls of fruit mixture, and spin just once or twice around. Transfer 1/3 of the base to an airtight container, swirl in half the fruit mixture, continue with the next third of the base, remainder of the fruit, and top with remainder of the base. Run a spoon through the ice cream to swirl the fruit throughout, but not completely mix through. 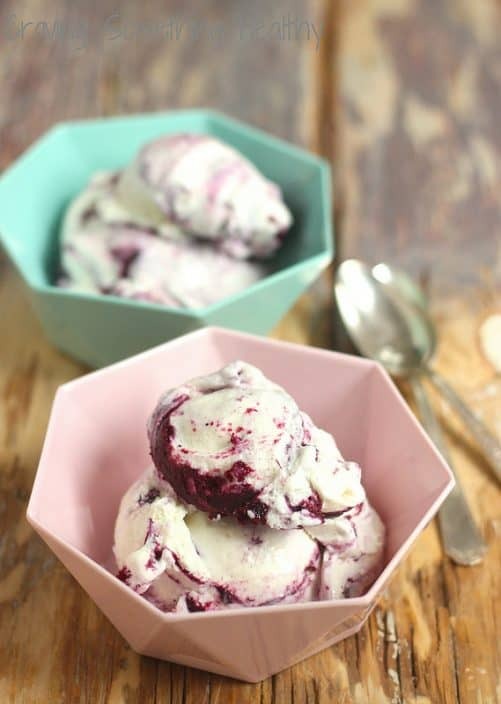 Press a sheet of parchment paper to the top of the ice cream, cover with the lid, and refrigerate for at least 4 hours. The recipe for the ice cream base was adapted from Jeni's Spendid Ice Creams at Home. Previous Post: « What’s Better ~ Farmed or Wild Salmon? Where are those amazing heptagon bowls from!! Shoot Hannah! I have no idea! Someone gave them to be as a gift 🙂 Glad you like them though! 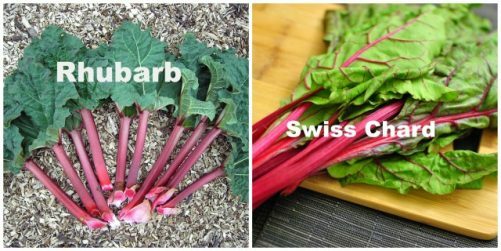 Cracking up over your swiss chard mix up because it sounds like something I’d do. I’m pinning this one as I adore rhubarb!